Yoga postures work to stretch muscle groups, open the joints, align the body and to tone and bring more blood into the internal organs. 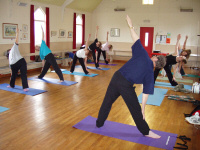 Life Movement Yoga can be practiced by anyone of any age and physical ability. There is no emphasis in trying to achieve anything in Yoga. We simply allow the body to open and express itself to a point where the practitioner feels stable and relaxed within any posture, breathing comfortably. 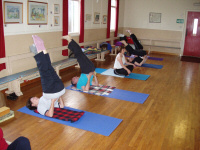 A series of forward back and side bends along with side twists make up the part of the session using postures. Breathing (Pranayama) is a big part of Yoga. There are many kinds of exercises to enhance, deepen and calm the breath which are normally done in a sitting position - either on a chair or cross legged. In time, the effects of breathing practice are profound. Changing the blood quality, lowering the blood pressure and energizing the whole system - and it also prepares the practitioner for meditation . There are many kinds of meditation techniques covered, from repeating a sound to Visualization. Although the favoured practices are just sitting Shikantaza and Chinkon - which cannot be explained in words but have to experienced and practiced first hand. Yoga Nidra (sleep of the Yogis) although sleep is the last thing that you want to happen when you practice Yoga Nidra. 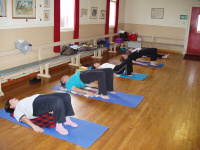 The person lays on their back, arms by the side and slowly brings awareness to different parts of the body in turn, releasing any tension they find until every part of the body is deeply relaxed. Classes and Private sessions are open to anyone with an interest.